Experiencing a crisis can be overwhelming and sometimes it can be even harder to ask for help. There is help available right now. If you or someone you know is in crisis, or having thoughts of suicide, or maybe really isn’t sure what is going on or how to ask for help please contact any of the help lines and resources listed below. Need Help with a Child or Teen Mental Health Crisis? 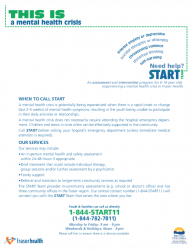 Start is an assessment and intervention program for 6 to 18 year olds experiencing a mental health crisis in Fraser Health. If you are considering suicide, in crisis or are concerned about someone who may be call the crisis centre at: 1-800-784-2433. Crisis line workers are available anytime of the day or night. 24 / 7 counselling help from trained professionals available on the phone for children and youth up to age 20. 211 is a confidential, multilingual telephone service which provides free information and can connect you to a wide range of social, community and government services. Phone 2-1-1 or message BC 211 by texting the name of your city to 2-1-1. Transgender & Experiencing A Crisis or in Need of Support? Trans Lifeline runs a crisis line staffed by transgender people for transgender people. Trans Lifeline volunteers are ready to respond to whatever support needs members of the trans community might have. Available 24/7 the mental health support line will connect you with crisis line workers who are trained to help provide emotional support, information on appropriate referral options as well as mental health information and resources. Are you a child or youth and need to talk to someone? Call 310-1234. This help line is available any time of the day or night and you do not have to give your name. Are you or someone you know in danger or being threatened? The youth against violence line is an anonymous, confidential, 24/7 line available in multiple languages. Speak to a Youth Against Violence Support worker if you are concerned about your safety or the safety of others. Youth Against Violence Line - Stand Up. Be Heard. Get Help. Available 24 hours a day 7 days a week the KUU-US Crisis Line provides culturally sensitive crisis line for Aboriginal adults / elders , children and youth. KUU-US means "people" in Tseshaht language. If you or someone you care about is needing help with any kind of substance abuse issues call 1-800-663-1441. It is a confidential, multilingual service available 24/7 and provides information and referrals to education, prevention and treatment services. Call 1-800-663-9122 any time day or night if you think a child or youth under 19 years of age is being abused or neglected. It is your legal duty to report your concern to a child welfare worker. If the child is in immediate danger call 9-1-1 or your local police. Are you a victim of crime or unsure if you may have been a victim? Call 1-800-563-0808 a confidential, toll-free, multilingual service available 24 hours a day, 7 days a week. VictimLink BC staff are trained victim service workers that can connect people to information and referral services. VictimLink BC also provides immediate crisis support to victims of crime including family and sexual violence,and human trafficking exploited for labour or sexual services.